Or maybe I change out some of the items on her picture rail and display the art in various sized frames, like in these photos? If I get enough pieces, doing something like this would be fun... scan all the individual artworks and create a poster out of them! I like this idea too... create a chalkboard canvas. 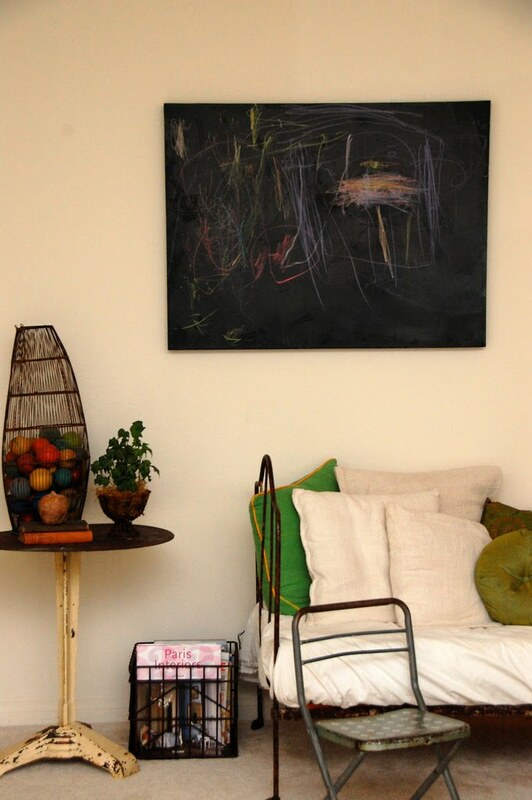 Rather than have a whole chalkboard wall, having a canvas like this elevates the art and makes it seem much more sophisticated and special, don't you think? 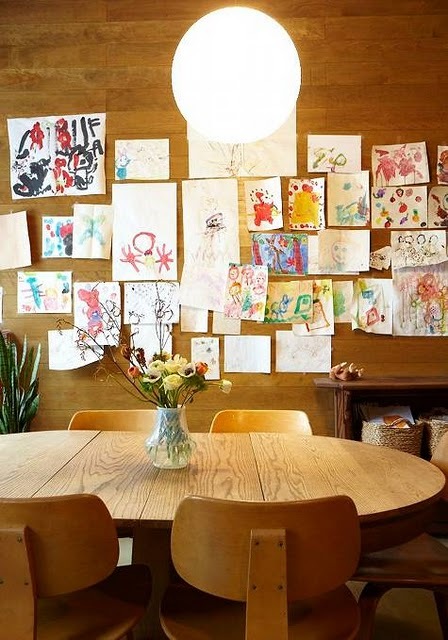 Do you have a budding Picasso at home? How do you display their art? I love the giant Ohdeedoh piece. 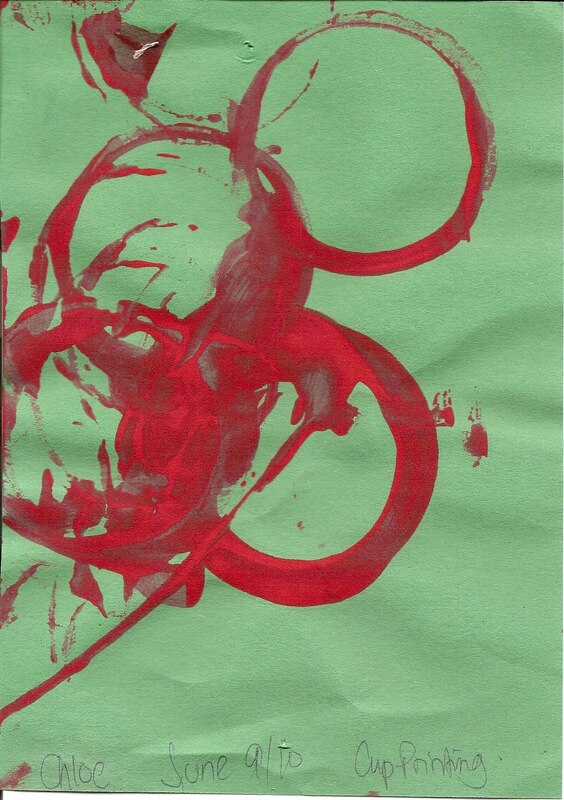 I am in the process of scanning my daughters art now so that I can display it. posterjack.ca has great prices on large prints and good 'ol Ikea frames rock. I too, love the Ohdeedoh idea...and I have to tell you Jenn, you WILL definitely get enough pieces! It is less of an IF, and more like...WHEN. Hahaha. Yes, I have been thinking about this for a while now. With preschool starting up again soon I better get on it. Love your inspiration ideas and thanks for the reminder! In the upstairs hall I have rails with both framed family photos and the kids masterpieces...we also have a big cork board in the playroom and I've also framed a few and created a gallery wall in the mudroom. Lets face it they are everywhere! Each child also has a basket where we keep things we aren't yet ready to get rid of...we go through every once in a while and toss a few! All really great ideas. I like that chalkboard canvas. Haven't seen that before. I also like the poster with all the drawings on it! I love the inspiration picture of the bench. I'm sorry, but your daughter is ridiculously talented! I LOVE the scan/poster idea. Perfect. the poster all the way....now just have to get around to pulling them out of the boxes and up on the wall. Fun post. Another great idea is to scan and make a coffee table book out of them...another to do for me! I have a large (like 3x5 feet) framed corkboard in the playroom. My oldest can pick what he wants to display. Every so often we go through and make room for new stuff. Larger/bulkier projects I take a picture of him holding, and usually dispose of the project itself. The 3 year old will be going to school this year...I'll be putting up another corkboard. I know ... the artwork that Mackenzie comes home with is so cute. I love that poster idea for when she is older and has accumulated a large collection. I'm starting to frame some of their artwork. I am thinking of creating a little gallery in our basement/playroom. Thanks for the inspiration photos! p.s. I just found your blog and LOVE it!! 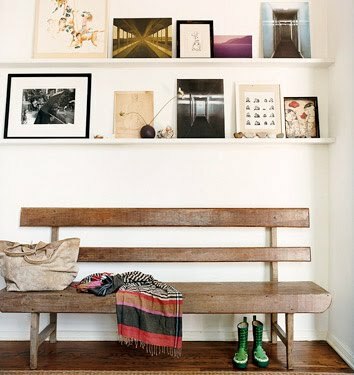 I really like the picture rail idea. I also love that you titled Chloe's "red cup on green paper" so cute. I can't wait till Olivia is able to create such beautiful artwork. Love the poster idea. I posted an idea I found last week. I've got a 26 month old and the art is starting to accumulate already! I like the clipboard idea you showed about two posts ago from Elle Decor. I think it is a great way to easily exchange out the art work and keep it looking somewhat neat and tidy. But, I could easily add the rail and put them on there. Will have to think about it a bit more. I was also thinking about putting some on the open stairs to my attic. Would be a nice colorful touch and an area that we walk by frequently so we would still enjoy them. That poster idea is fantastic. I'm putting that in my memory bank for any future kiddies. Wow - great ideas everyone! Thanks for sharing! 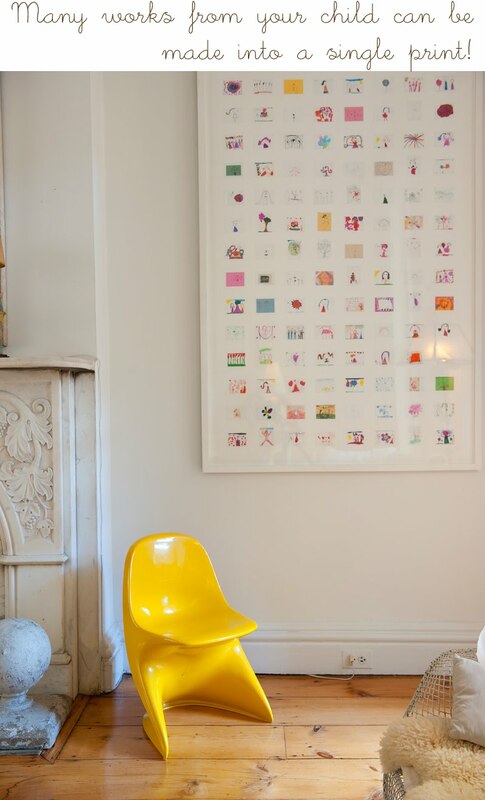 Its sounds like many of you have multiple art zones in your homes. I'll keep these ideas in mind as we start planning details for the basement and other unfinished spaces. Thanks so much for stopping by my blog earlier this week! Hope you'll stop by again! I really love your remake of the mini-chair for Chloe, too! She's so adorable! 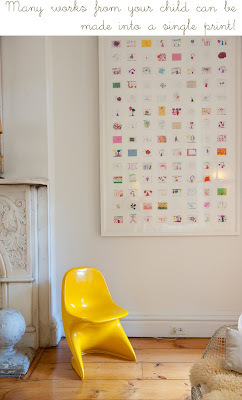 I think it's so cool when people display their childrens art around the house - it makes it feel like such a cozy home. I've never seen the poster of the mini works of art before, though - that's a great idea, esp if there's not much room to display the pieces! I love the one of them all scanned onto one big piece. I love all of these ideas! The one that really hits home is putting the art in frames and displaying on a wall. I ran across a company that does canvas printing for next to nothing, and have displaying my 4 year old's artwork on canvas. I was intending on re-decorating the game room and his room and I decided my little one's art on canvas would take care of the wall part of things. It came out beautifully, and now my 4 year old is even more inspired to create! (by the way, ezcanvas.com is where they are the cheapest and best quality imo and I got my first one free).